Some say it could be an inside job because the man is married to more than one wife, others say it could be as a result of his involvement in politics. 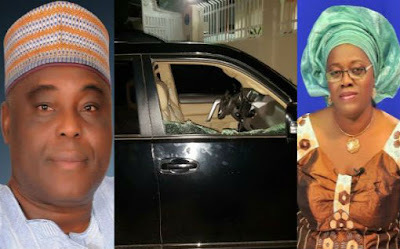 Shandileo.com gathered that Chief Raymond Dokpesi, owner of DAAR Communications and one of his wives, Tosin Dokpesi, narrowly escaped death on Saturday in what appears to be an assassination attempt. According to an eyewitness, four suspected assassins were sighted in a Honda Accord car. They accosted the deceased in front of Child Care and Awareness Clinic at No 7, Fez Street, Off Kumasi Crescent Wuse 2 Abuja at 2.30am on Saturday, June 4, 2016. “The Managing Director of Africa Independent Television, Dr Mrs Oluwatosin Dokpesi who had arrived from Lagos complained of serious stomach cramps and was rushed to the Child Care and Awareness hospital in Wuse 2. She was accompanied by her cousin Ms Abolore Sode and an aide, Ms Aisha Adamu. They were escorted by the deceased sergeant. They were trailed by the Honda Accord and as soon as Mrs Dokpesi alighted from the car and entered the hospital, the assailants attacked them. They were asking the driver and sergeant about Mrs Dokpesi’s whereabouts. They collected the handset of the driver and shot the sergeant thrice and made away with the AK47 of the sergeant.